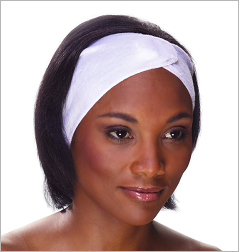 Washable headband for facial treatments and make-up application. These terry headbands are lightweight with a lot of give. Generous Velcro closure allow for a comfortable fit. They're ideal for any kind of facial treatment, cleansing, cosmetic application or any use that require the hair to be kept off the face. Machine Washable. Color: White. Size: 4" W x 18.25" L without stretch, 24" L stretched. Three headbands per pack.